Peep toe slingback with elastic gore on instep for a secure fit. Recessed heel seat. Leather linings and leather padded insole. Rubber sole. 2 inch hidden wedge heel. Made in Italy. The ancient soul of a new story. The Brand. Made in Italy: one title for so many different stories. The key names and places may vary, but the true sense of the work remains unchanged: a great passion for quality. Pas de Rouge’s Made in Italy is located in the footwear district of the Brenta, the waterway that connects the mainland to Venice. It is here where, over the centuries, master craftsmen have created shoes for Doges and Princesses, moulding an elegance that has taken shape right through to today. Here, together with Pas de Rouge, the Gritti shoe factory is writing the latest chapter of a story of style and, once again, of passion. Soft Appeal. Fewer than 150 grams, 30 years of Italian manufacturing and a unique style 24 hours a day: all this in just one shoe. Pas de Rouge stems from an idea to renew the slip-lasting “a sacchetto” method, an all-Italian shoemaking technique with a feminine, fresh and contemporary design. 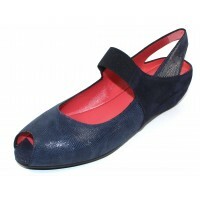 Peep toe slingback with elastic gore on instep for a secure fit. Recessed heel seat. Leather linin..